Sadly, dental implant failure is not all that uncommon. Since implant dentistry is not a recognized dental specialty, any dentist can place implants with no post-graduate training at all. Sometimes dentists will try to cut corners to keep costs low. This typically means compromising on the quality of the materials or offering shorter healing times. Therefore, it is not surprising that dental implants have one of the highest percentage of dental malpractice lawsuits. Dr. Coleman has seen far too many patients who have fallen victim to dental implant failure. As a Fellow of the International Congress of Oral Implantologists, he feels more dentists should be upfront about the potential risks involved with implant dentistry, as well as the consequences of choosing a dentist that may not have the proper training and credentials. The reasons for dental implant failure vary in severity. Infection – Dental implants can become infected if the fixtures are not placed properly. Infection also occurs if they are not fitted properly or if poor technique was used in the surgical phase. Loose Implants – If there wasn’t adequate healing between the surgical and restorative phases, implants may become loose. Or, they can become loose if there wasn’t high enough bone density at the implant site. This may also happen if inferior fixtures were used. Nerve Problems – Dr. Coleman has seen cases where there was nerve impingement from a dental implant. This can cause the patient ongoing numbness, pain, or tingling. To avoid nerve damage, we use highly sophisticated 3-D CT scanning techniques. This technology shows us the exact location of nerves and blood vessels. Puncture of Body Cavities – Improper placement can lead to serious implications and the risk for puncture to the sinuses, the nose, or other body cavities. The 3-D CT scanner also gives us a complete picture of the sinus cavities and the surrounding anatomical structures, as well as the complete composition of the jaw. This technology can help ensure our patients don’t fall victim to the serious problems that may result from implants puncturing body cavities. Improper Diagnostics – Many dentists only use a 2-D panographic scan when placing implants. Dr. Coleman doesn’t feel that a 2-D scan is sufficient in identifying the precise location of nerves and blood vessels, nor does it properly communicate the bone density of the patient. As previously mentioned, 3-D scans are phenomenal in identifying all of these factors, as well as the structural makeup of the sinus cavities. 3-D scans are invaluable during the diagnostics and planning phase. Medical History – In some cases, certain medical conditions may complicate the success of the dental implant procedure. Open communication between all of the patient’s physicians and specialists can help to avoid these unnecessary complications. Substandard Implant Fixtures – There are hundreds of companies that sell dental implant fixtures. Yet only six manufacturers can provide proper research and documentation to validate their quality. FDA-approved fixtures cost hundreds of dollars apiece. Non-approved fixtures can cost a small fraction of that amount, so it is tempting for some dentists, looking to compete on costs, to try to economize with substandard fixtures. Improper Placement – An insufficient diagnostics phase can lead to improper dental implant placement. Also, at some practices, there are multiple dentists involved in the surgical and restoration phases. Therefore, miscommunication between the two is a possibility. 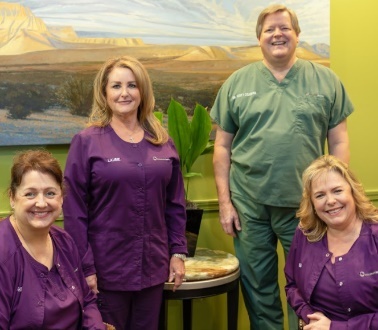 Dr. Coleman performs both the surgical and restorative phases at his office. If you are considering dental implants, Dr. Coleman will present all of your options and help you determine the right solution for you. Call 713-783-2800 to schedule your consultation with Dr. Coleman today.